Club members pitch in to unload soil at the new pocket park in downtown Lyndon. 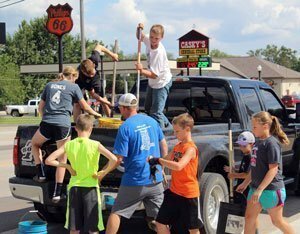 The August meeting for the Lyndon Leaders 4-H Club included a little community service and fun. Members split up tackling two community projects: Adding dirt to the flower beds in front of their wall project on Main Street, and pulling weeds and trimming plants in front of the Lyndon High School, just in time for back-to-school enrollment. After working up a sweat, the club headed to the Lyndon pool for a short meeting and potluck, followed by a well-deserved swim. This was a celebration for all their hard work as they wrap up their 2016-2017 4-H year. Congratulations to all of our members for their awards received at the county fairs and for all the community service hours they put in to make our town a better place. 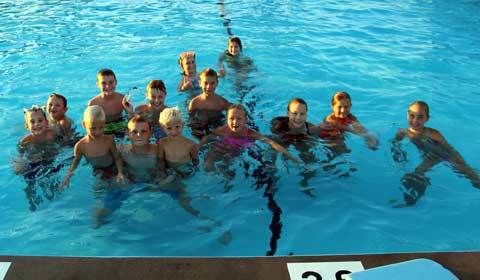 Lyndon Leaders 4-H Club members celebrated with an end-of-the-year pool party.